I am always learning, reading, attending seminars listening to my coaches and releasing my creativity for my clients. 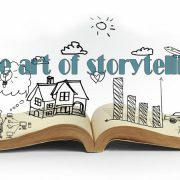 Today, I want to share with you why mastery in storytelling is imperative. Why we tell, a story has a great effect on “How” we tell a story. As a Strategist, I know that telling a story to a prospect is important because I want my prospect to experience safe and trustworthy emotions when it comes to my brand. ( I am sure you would want your prospects to feel the same right? )It is also because I want the prospect to recognise my authority, authenticity and experience in the area. So internally they can react by, feeling safe, convinced and convicted that buying into my service is the right thing for them to do to Improve their life and future chances. I would like you ( I would love you) to tell a story for the same and even more reasons. A great story is always simple, authentic, easy to understand and in a language and communication mode easily understood, digested and acted on by the intended recipients. Last week Thursday, two members of my mastermind group Amara Kanu and Anne Ogunlesi, told their stories to a sold out room at The Solid Woman conference, Trafalgar Square. These ladies told their stories in a simple, authentic, emotive, truthful and valid way. They also made their audience the centre of the story and spoke to them like royalty. If you were to ask Amara or Anne about their success, they would start with their “Why” and how they used their “Why” to share emotive stories. Needless to say when they asked the audience to give them their contact details, willingly they did, and with it a number of media interviews, requests for further paid speaking engagements and to round it of (only as a master of storytelling can do), the whole room of their free will stood up and gave a rousing, tearful ovation. I have some tips that I would love to give you. If you would like this, just connect with me here https://www.facebook.com/groups/GBPBusinessclub/edit and I’ll get them across to you. Would you too like to have a pre-organised opportunity to speak to a responsive audience in a sold-out venue in Trafalgar Square? Would you like to be paid for this? Would you like to develop a business model that keeps you getting paid? Would you like to belong to a network of very successful business owners? If you answered YES to any of the above, then you need to master the art of authentic STORY-TELLING, that comes straight from the heart, but delivered with a winning formula. If you have any other questions, head over to my Facebook group here https://www.facebook.com/groups/GBPBusinessclub/edit/ and ask, and I will respond to you.